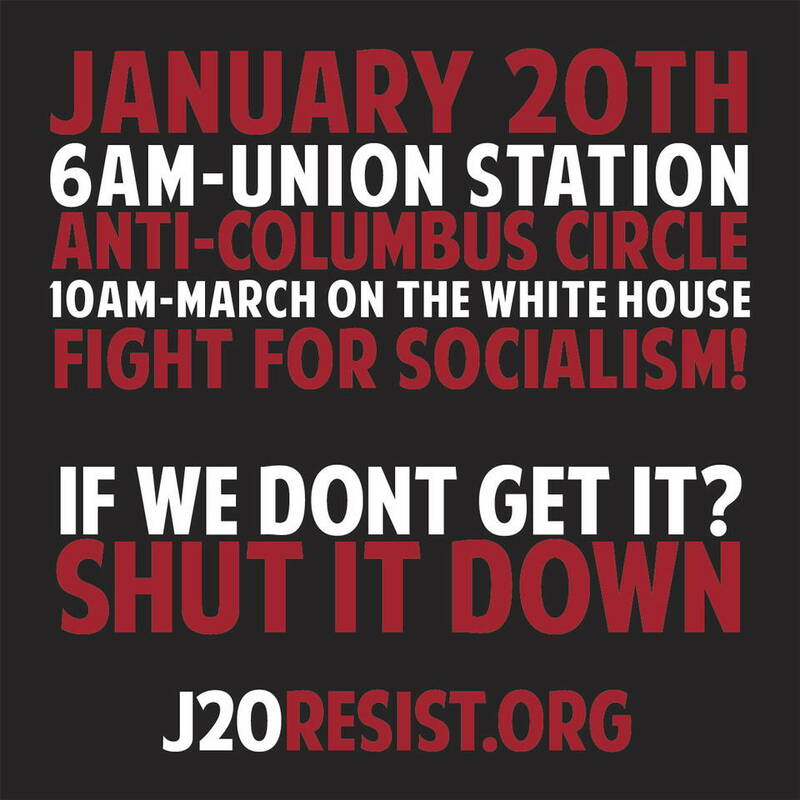 Home » Coast to coast » #J20 mass protests planned: FIGHT TRUMP! #J20 mass protests planned: FIGHT TRUMP! Jan. 1 — People are organizing all over the United States to go to Washington, D.C., on Friday, Jan. 20, and spoil Donald Trump’s “inhoguration.” The racist, sexist predator threatening to ramp up the nuclear arms race will be met with mass protests at #J20Resist. J20 organizers are calling for people to gather at what they are renaming “Anti-Columbus Plaza” in front of D.C.’s Union Station at 6 a.m. on Jan. 20. A march on the White House will begin at 10 a.m. The cops and agencies of the state are trying to stop people from saying “No to Trump!” Racist cops love Trump, who called Mexican immigrants “rapists” and who wants to crush the Black Lives Matter movement. Ludicrous limits are being set to attempt to stop demonstrators. Among the items the cops are trying to prohibit at checkpoints are backpacks, balloons and even signs larger than 8 by 6 by 4 inches — about the size of half a sheet of typing paper! But none of these police state measures are stopping organizers from filling buses. J20 organizer Nate Peters says that 100 people have already signed up to go from New York City. Buses are leaving from 147 W. 24th Street in Manhattan at midnight on Jan. 20. The deadline for NYC ticket sales is Jan. 11. Baltimore activists at the Harriet Tubman Solidarity Center are organizing a Martin Luther King Jr. march on Saturday, Jan. 14, to kick off a week of action leading up to J20. The MLK Day march will link the student and youth movement against Trump with the movement by community residents. It will demand an end to police terror; jobs, not jails; and a $15 minimum wage with union rights. The Baltimore and Maryland Organizing Committee for J20 Resist will also be getting people on MARC trains to go to D.C. for J20. Tickets are $8. Boston is sending a bus to J20 with tickets at $60. Natalie in Port Huron, Mich., says she is “pretty excited to go to D.C.” Two buses are leaving from Detroit, organized by the Michigan Emergency Committee Against War & Injustice and the Moratorium Now Coalition. Tickets are $85. Buses will leave Detroit at 9 p.m. on Thursday, Jan. 19, and return on Saturday, Jan. 21, around 4 a.m.
A van is coming from Huntington, W.Va.; some seats are still available. A fundraiser for the Philadelphia bus will be held at Service Employees Local 688 hall at 1924 Spring Garden on Jan. 6, starting at 8 p.m. Good music from local bands will be featured with a $7 to $10 donation. No one will be turned away for a lack of funds. The International Action Center in Rochester, N.Y., is sending a bus to protest Trump. It leaves Rochester at 11 p.m. on Jan. 19 and returns by 1:50 a.m. on Jan. 21. 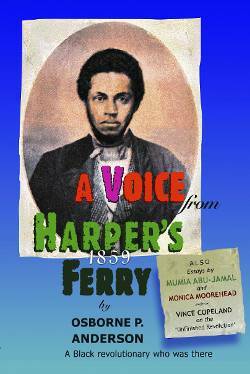 Seats are $60; ask about scholarships and subsidized seats. Activists in New Orleans are organizing an “Anti-Trump Inauguration Rally & March” on Jan. 20 at 3 p.m. in Duncan Plaza. That’s in front of City Hall at 300 Perdido Street. The action is being initiated by Take ‘Em Down NOLA and the New Orleans Workers Group. For more information about buses leaving from your area, or local anti-Trump actions in your city, go to J20resist.org. For information on New Orleans contact [email protected] and for Oakland contact [email protected]m.
To order bus seats, contact New York 212-627-2994; Baltimore and greater Maryland area 443-221-3775; Boston 617-522-6626; Detroit 313-680-5508; Huntington, W.V., 304-690-6048; North Carolina J20resist.org; Philadelphia 610-931-2615; Rochester, N.Y., 585-436-6458.